The 2016 Ram 1500 comes with a newly upgraded center console, serval new colors and a host of other new amenities that make an already superior full-size pickup truck and even better option in it's class. Whether you need a truck for style or to get down and dirty at work or during a weekend getaway, the Ram 1500 is comfortable getting the job done or having a little fun. At Lakeland Dodge, we pride ourselves in being one of the premier dealerships in the entire area. Our team consists of knowledgeable and friendly Ram representatives, so if you are near the Wesley Chapel, Tampa, Brandon, Wauchula, Brooksville, Orlando, St.Cloud, Kissimmee, and Winter Haven come down to Lakeland Dodge to discover the 2016 Ram 1500. We look forward to serving you today! The 2016 Ram 1500 is an excellent pickup whose performance rivals any other truck in it's class it's driving experience is that good. 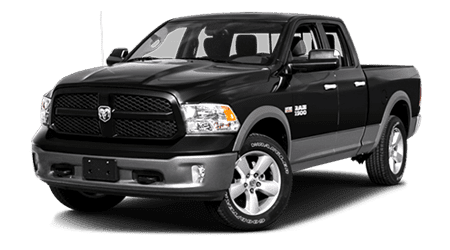 Underneath the hood, the Ram provides three engine options: a base level 3.6-liter V6 eight-speed automatic transmission capable of producing an impressive 305 horsepower and 269 pound-feet of torque. The upgraded model, which is only available on the top level trims, offers a robust 5.7-liter V8 engine with a six or eight speed automatic transmission capable of producing a whopping 395 horsepower and 410 lb-ft of torque. The third engine option is the "EcoDiesel" turbocharged 3.0-liter diesel V6 engine that focuses on fuel economy with an EPA estimated 23 mpg, which is an astonishing number for a full-size pickup. Either engine you choose will provide nothing but a well-built piece of machinery that pushes the limits of what a pickup truck can and should be. The 2016 Ram 1500 is a big truck with even bigger features. The 1500 comes in multiple body styles with a whopping 11 trims; Tradesman, Express, HFE, SLT, Big Horn/Lone Star, Outdoorsman, Sport, Rebel, Laramie, Laramie Longhorn and Limited and while there are far too many trims to breakdown here, buyers can be sure they will have ample choices when picking out a Ram 1500. The entry-level Tradesman comes equipped with 17-inch wheels, active grille shutters, a receiver hitch, vinyl floor coverings and a locking tailgate among other things. Amenities at the top-level Limited trim offer up 20-inch wheels, heated seats, HD radio, LED bed lighting, a larger fuel tank, upgraded leather upholstery and a 10-speaker audio system. However, no matter what version of the 2016 Ram 1500 you might choose, the full-size pick will be one of the most well-crafted trucks on the road. Safety inside the 2016 Ram 1500 starts with a high-strength steel body equipped with dynamic front crumple zones to help lessen the impact of a collision. The pickup also offers four-wheel anti-lock disc brakes, side impact beams which help absorb energy from side collisions, multiple cabin airbags, hill start assists and trail sway control among other things. Full size pickups are typically active vehicles at work and on the road, and the automakers at Ram understand that safety and security should come standard in every truck they put on the road. Overall, the Ram 1500 does not skimp on safety and clocks in as one of the best trucks in its class. With a smooth and refined ride, a responsiveness usually reserved for smaller vehicles, the 2016 Ram 1500 is more than just a pickup truck. The Ram can eat up the road, take a right turn into rough terrain and handle it with ease, and then pull into a valet parking station and look right at home with other luxury cars. For buyers planning to purchase a new vehicle, versatility should be of the most importance, and the Ram provides that in spades. When you are ready to discover the premier full-size pickup truck on the market, stop by Lakeland Dodge, where we treat customers like old friends. We serve patrons from Wesley Chapel, Tampa, Brandon, Wauchula, Brooksville, Orlando, St.Cloud, Kissimmee, and Winter Haven and are located at 2335 Highway 98 N, Lakeland, FL 33805. Stop by to schedule a test drive in the 2016 Ram 1500 today!